We have an experienced in house design studio ready to create your bespoke voucher designs to match your brand or reflect the style of your business. As well as a huge range of templates to choose from, we can design something special just for you when given a logo or design brief – or simply ask us to match your own website. Our gift vouchers are secure, this means they cannot be copied or reproduced down the line, something not all online print stores can offer! With us you know all gift vouchers presented in your store are genuine, and with these security features built in as standard, you can quickly check at the time they are redeemed. We have years of experience producing secure printed materials, so you can rest assured a Secure Voucher is legitimate. We have it all! We offer a full suite of gift voucher stationery, so we’re a ‘one stop shop’ to get up and running with your gift voucher sales. We have the accessories to match your vouchers, including posters, cards, stands, and envelopes. We even have offers if you purchase as a bundle, so you get a whole matching set, and save money too – Just give us a call on 0800 6893235 to find out how this works. 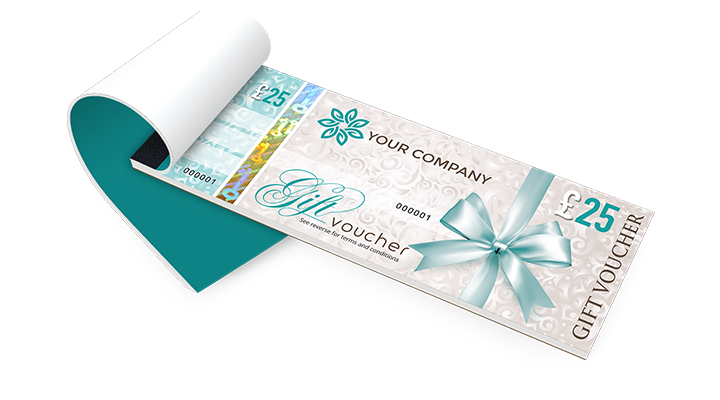 Gift vouchers are a great way to generate extra revenue for your business! By advertising them as a premium product, you encourage customers to impulse buy a gift voucher for a friend, in turn bringing in a new customer, and usually they will redeem higher than the value of the voucher, depending on the £ value you offer, which you can tailor to your business, we can print any value you like, so you can choose what works for you. Maybe you want to think outside the box? You could have a 20% off voucher for online purchases, or a ‘Free Gift with purchase’ voucher, perfect for locking in seasonal purchases! Added features and bonuses – we can add custom QR Codes to your vouchers, that can be a link to your website, Facebook, Instagram, whatever you like! (as long as its got a valid URL of course) We can also create alpha-numeric codes, these can be linked into your website leading customers to make online purchases, and in turn build more traffic to your website. We also have the ability to add barcodes to your vouchers, so they can simply be scanned at your till, saving time and providing a smooth customer transaction. Gift vouchers are often overlooked, but make so much sense when it comes to growing sales and building your business, as they are a direct purchase, any unspent gift vouchers go straight to your bottom line. We have a UK based experienced team that are happy to help create a fantastic premium and bespoke product to offer your customers, and keep them returning time and again.